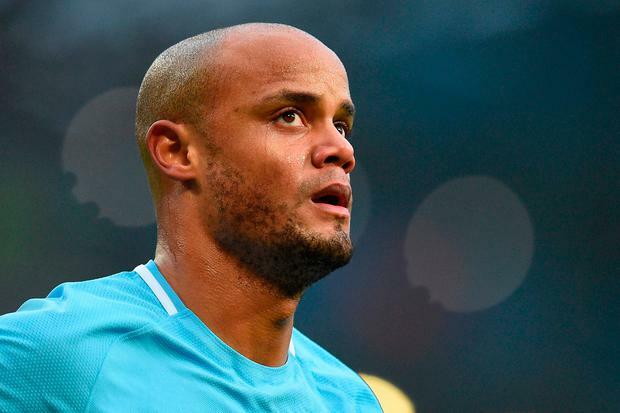 Vincent Kompany has warned his Manchester City team-mates they cannot afford to rest on their huge Premier League lead. The City captain knows from personal experience that big advantages can quickly evaporate. Admittedly, the Belgian's memories of such scenarios are positive having been the leader of the City side that overcame an eight-point deficit to beat Manchester United to the crown in the 2012 run-in. But as City - with a game in hand - head to Newcastle tonight with a seemingly impregnable 12-point lead at the summit, Kompany insists the chasing pack should not be written off. The Belgium defender said: "I don't know if everyone will remember but it was six games left and we were eight points behind, so that's why I am always the first to come in and say, 'No guys, we can't really take the foot off the gas'. I really don't want that. "We push, we push, we push, and no-one has the right to let their performance down or their guard down." City look completely at ease but their position is a relatively unfamiliar one for the club. As well as the dramatic last-gasp success of 2012, their last title in 2014 also came about as they overhauled Liverpool in the closing weeks - only sure of the title on the final day of the season. "It's the first time we have been ahead like this," said Kompany. "Honestly, I don't feel too much difference, but it's a bit too early to draw any conclusions. "But I do feel like we have been in much more high-pressure environments, (like) when we had to play United and we were three points behind. "Those are the games that are completely different to any others you will play in your life. "But at this moment in time we have got the chance. We are in a position where we can just focus on our football, not anything else, and winning the game and having the performance at the same time. It's a bit different, but the desire to win is there." Pep Guardiola has made clear on numerous occasions he will not tolerate any complacency from City's players and Kompany feels the senior members of the squad have a duty to back up the manager's words. He said: "I think we all have a role to say something and there are a lot of experienced players in the team. We do mention it but the manager will have mentioned it many times before as well. "We all have that (winning) feeling and we don't want it to go away."